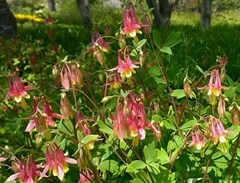 Aquilegia canadensis is a Missouri native spring wildflower which occurs in rocky woods, slopes, ledges and open areas throughout the State. Features drooping, bell-like, 1-2", red and yellow flowers (red sepals, yellow-limbed petals, 5 distinctive red spurs and a mass of bushy yellow stamens). Delicate, biternate foliage is somewhat suggestive of meadow rue (Thalictrum) and remains attractive throughout the summer as long as soils are kept moist. Flowers are quite attractive to hummingbirds.